Grubs are a problem in lawns all over Northeast Ohio this time of year, and continuing on into early fall. How do you know whether grubs are feeding on your lawn? With the dry weather we’ve had lately—a real switch from the June monsoon conditions—many commercial properties are struggling with brown spots. You might be wondering, are grubs the cause? 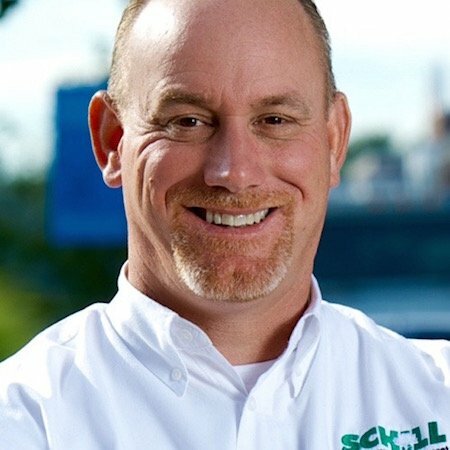 Here are three surefire ways to identify lawn grub damage in Northeast Ohio, and when you should do something about it. Before we talk about identifying a grub problem, let’s spend a moment addressing what a grub actually is. Grubs are the immature form of various beetles, including Japanese beetles, June “bugs” (which are also beetles) or European chafers. Lawn grubs are white, C-shaped and the size of your fingertip. Eventually, grubs turn into adult beetles, fly up from the soil, mate, lay eggs—and there you’ve got a potentially damaging grub cycle in your lawn. 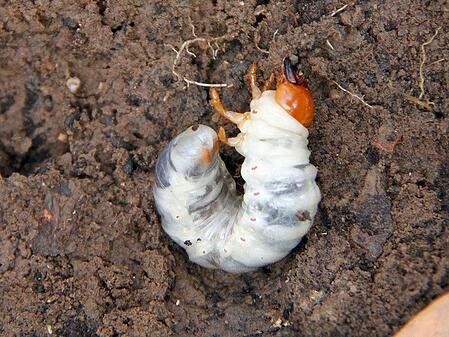 Grubs are a hot topic now because midsummer is egg-laying season. This makes August an ideal time to identify grubs before they hatch, mate and repeat—and treat your lawn appropriately so you can prevent grub damage. Whether it’s relatively new sod or an established lawn, most lawns have some grubs—and this is O.K. We expect a healthy number of grubs. An infestation is when you spot 10 or more grubs in a square foot of lawn. Here are three red flags that your Northeast Ohio lawn has grub damage, and when you should do something about it. 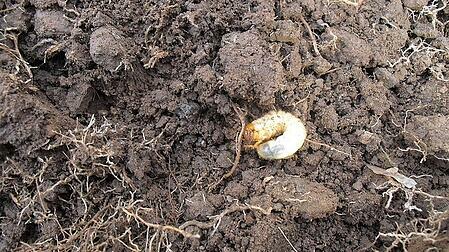 Grubs feed in the soil underneath lawns, compromising the grass roots. So, damaged areas of turf are easy to lift up from the ground. If you spot a brown area, see if you can roll that section of grass up like a carpet. If you can pull up grass and you see no roots, grubs were probably the culprit. Skunks, raccoons, moles and birds will tear up your lawn to reach the grubs underneath. Ravaged areas of your lawn are a definite sign that something’s going on underneath the grass. However, keep in mind that animals also dig for worms and other insects, so perform that “roll-up” check we described can reveal the culprit. If you notice spongy areas, take a closer look: Peel away that section of turf and inspect for roots. Are there any? Can you see the white, C-shaped, soft-bodied grubs? Count them. Are there 10 or more in a square foot section? If you find 1 to 5 grubs in a foot of lawn, that’s perfectly acceptable and there is no need to treat. A healthy lawn can handle some grubs. On the other hand, a stressed lawn with 6 to 9 grubs per square foot could require intervention. Catching grubs early in Northeast Ohio is the key to successfully treating (and saving) your turf. The best time to apply pesticides is when newly hatched grubs are feeding—before they mature, mate and create more eggs. Mid- to late-summer into early fall is prime time for grub treatment, during this peak egg-laying season. There are two ways to treat any lawn disease and pest: curatively or preventively. Obviously, if you can prevent grub damage and stop young grubs before they populate your lawn, you’ll avoid turf damage. A grub preventive will treat existing grubs and those that are hatching. A grub preventive can be applied in spring, and again in fall to manage any grubs that fester beneath the surface until spring. Curative treatments also should be applied while grubs are small and feeding — particularly this time of year. 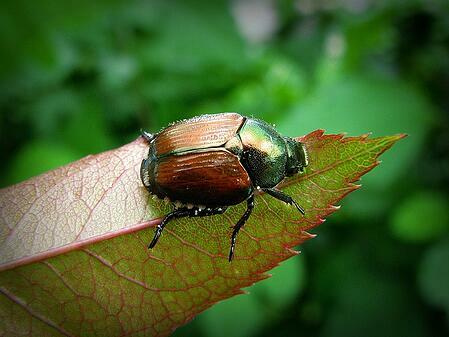 It’s a critical component to saving a lawn that is severely infested with grubs. Because grubs are stubborn and spread quickly, they will not go away on their own. Grubs don’t just die out, and they will cause a great deal of damage to your commercial property while they’re feeding. If you neglected preventative grub treatment this year, let’s talk more about commercial lawn care strategies for keeping your lawn healthy and disease-free as we move into late summer and fall. Call us any time at 440.327.3030, or fill out this simple contact form and we’ll get in touch with you.